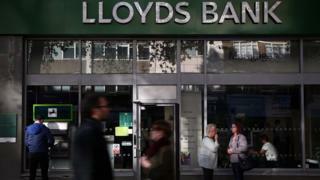 Thousands of customers of Lloyds Bank have had their personal details stolen, following the theft of a data box, the bank has confirmed. Police from the Organised Crime Unit are investigating the incident, which happened on 30 July. The customers affected have a Premier Account with Lloyds, which comes with emergency home insurance. The stolen device contained details of their names, addresses, account numbers and sort codes. It is described as being the same size as an old-style video recorder, so is perfectly portable. It was taken from a data room belonging to Royal Sun Alliance (RSA) insurance, which provided the home cover. The theft only affects customers who opened their accounts between 2006 and 2012, and who subsequently made a claim on the insurance policy. "We recognise this should never have happened and apologise to all customers who have been impacted," said a spokesperson for RSA. However RSA said there was no evidence that it was stolen by fraudsters, and so far it is thought that no one has had their account compromised. Nevertheless customers are being advised to take out identity protection, as an extra layer of security. RSA said it would fully refund the £20 fee for two years cover. Lloyds said RSA was the insurance cover provider for "a small number" of Premier Account holders, and said it had contacted all the customers affected. Anyone concerned can call a freephone number 0800 316 8090. Further advice is available on the RSA website.